The USS Hornet is a "decommissioned american aircraft carrier built in 1942. It is now a museum in Alameda, CA". These first two picture were submitted by XBOG in 2001. 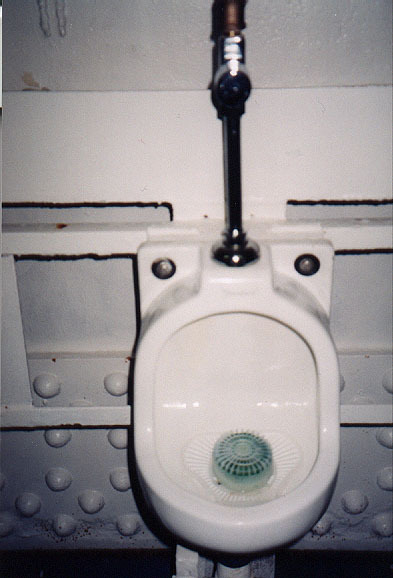 He writes: "These photos were taken in the "Enlisted Head" on the second deck. (They are still in operation!). They were made by American Standard. How lucky the Naval personnel must have felt to have these reminders of home sailing the seas with them. 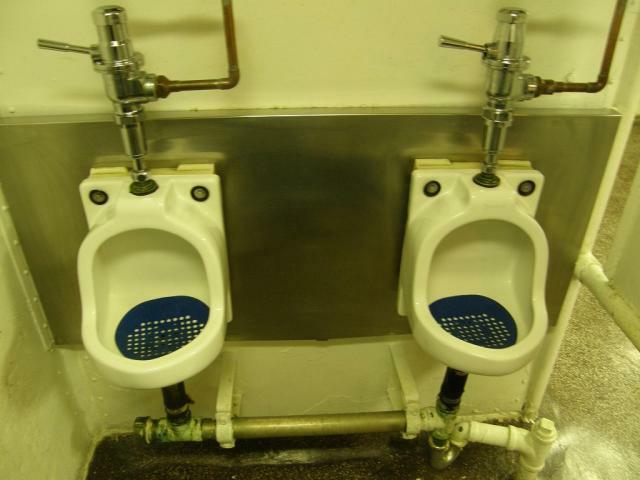 Many brave men who fought for our country used these urinals." About the USS Hornet from Wikipedia: "USS Hornet (CV/CVA/CVS-12) is a United States Navy aircraft carrier of the Essex class. Construction started in August 1942; she was originally named USS Kearsarge, but was renamed in honor of the USS Hornet (CV-8), which was lost in October 1942, becoming the eighth ship to bear the name. "Hornet was commissioned in November 1943, and after three months of training joined the U.S. forces in the Pacific War. She played a major part in the Pacific battles of World War II, and also took part in Operation Magic Carpet, returning troops back to the U.S. Following World War II, she served in the Korean War, Vietnam War, and also played a part in the Apollo program, recovering astronauts as they returned from the Moon. Hornet was finally decommissioned in 1970." This photo was sent in by TM in 2011. 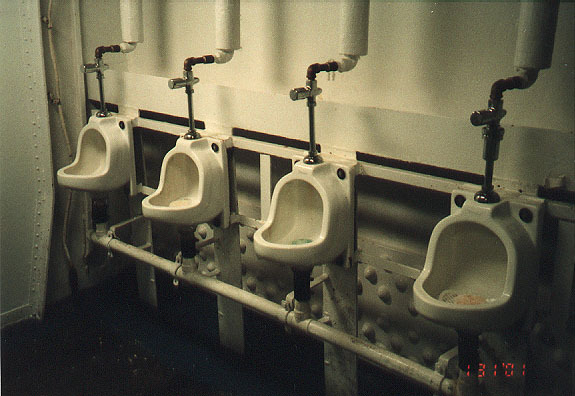 He notes that "the Apollo 11 and 12 astronauts... would not have used these [urinals] as they were immediately put in isolation suits and a mobile quarantine unit on arrival"